Los Angeles, CA, September 23, 2014 — Targeted Medical Pharma, Inc. (OTCQB: TRGM) a drug discovery and development company, announced the results of a second, double-blind clinical trial which confirmed that Theramine was shown not only to be more effective than ibuprofen in reducing low back pain, but also demonstrated a significant reduction in measures of inflammation. In this 28 day, multi-center trial, subjects taking Theramine as either a standalone medication or in conjunction with a low dose ibuprofen, demonstrated a significant reduction in both low back pain and inflammation when compared to baseline and ibuprofen. Ibuprofen alone did not impact back pain and showed increased inflammation when compared to baseline. The results of this study have been published online in the American Journal of Therapeuticsand can be viewed by visiting http://bit.ly/theraminehelpsbackpain. This trial examined the unique nutritional needs of patients with chronic back pain who at baseline showed reduced concentrations of the specific amino acids involved in reducing pain and inflammation. Subjects taking Theramine as a standalone medication showed significant improvements in plasma concentrations of these amino acids compared to baseline in addition to a reduction in pain and inflammation as measured by the Roland-Morris Pain Scale, Oswestry Disability Index, C-reactive protein (CRP) and Interleukin-6 (IL-6). Subjects taking ibuprofen alone showed no significant changes in these parameters. The results of this trial suggest that addressing the unique amino acid deficiencies associated with chronic pain using an amino acid based medical food can be significantly more effective at reducing pain and inflammation than NSAID therapies. About Targeted Medical Pharma, Inc. Targeted Medical Pharma, Inc. is a publicly traded, Los Angeles-based biotechnology company that is committed to drug discovery and development. The company currently develops and distributes amino acid based medical foods, a rapidly growing sector of medication technology, for the treatment of chronic disease, including pain syndromes, peripheral neuropathy, hypertension, obesity, sleep and cognitive disorders using the patented system of Targeted Cellular Technology. The company also develops a line of dietary supplements designed to support health and wellness. TMP currently manufactures 10 proprietary amino acid based medical foods, and recently launched its first dietary supplement, Clearwayz™. The products are sold directly to physicians and pharmacies in the U.S. The Company is also developing nutrient-based systems for oral stimulation of progenitor stem cells that differentiate into neurons, red blood cells, pituitary hormones including IGF-I. This press release may contain forward-looking statements related to Targeted Medical Pharma’s business strategy, outlook, objectives, plans, intentions or goals. The words “may,” “will,” “should,” “plans,” “explores,” “expects,” “anticipates,” “continue,” “estimate,” “project,” “intend,” and similar expressions, identify forward-looking statements within the meaning of the Private Securities Litigation Reform Act of 1995, but their absence does not mean that the statement is not forward-looking. These statements are not guarantees of future performance and are subject to certain risks, uncertainties, and assumptions that are difficult to predict. Actual results could differ materially. Targeted Medical Pharma expressly disclaims any obligation or undertaking to update or revise any forward-looking statement contained herein to reflect any change in the company’s expectations with regard thereto or any change in events, conditions or circumstances upon which any statement is based. Los Angeles, September 16, 2014 — Targeted Medical Pharma (OTCQB:TRGM), today announced that William Shell, M.D., Chairman, CSO and CEO is scheduled to present the latest company information regarding the advances in therapeutic nutrition and medical foods technology, at the 14th Annual Biotech in Europe Forum at the Congress Center in Basel, Switzerland. The presentation is scheduled for September 30th, 2014 at 11:45 am in the Lima Room. Dr. Shell will also be a panelist in the discussion regarding advancements in Neuroscience at 3:30 pm. Targeted Medical Pharma, Inc. (OTCQB: TRGM) is a publicly traded, Los Angeles-based biotechnology company that is committed to drug discovery and development. The company currently develops and distributes amino acid based medical foods, a rapidly growing sector of medication technology, for the treatment of chronic disease, including pain syndromes, peripheral neuropathy, hypertension, obesity, sleep and cognitive disorders using the patented system of Targeted Cellular Technology. Los Angeles, CA, August 14, 2014 – Targeted Medical Pharma, Inc. (OTCQB: TRGM), today announced financial results for its second quarter ended June 30, 2014. The Company posted increased revenues, gross profit and an increase in net income before interest, taxes, depreciation and amortization, and stock based compensation (Adjusted EBITDA*) on a quarter-over-quarter basis. Total revenue of $2.2 million, a 16% improvement from $1.9 million during the three months ended June 30, 2013. Total gross profit of $1.7 million, a 45% improvement from $1.2 million during the three months ended June 30, 2013. Adjusted EBITDA of $0.04 million, a 103% improvement from -$1.6 million during the three months ended June 30, 2013. Net loss for the three months ended June 30, 2014, was $0.42 million compared to a net loss of $7.84 million for the three months ended June 30, 2013. During the three months ended June 30, 2013, the Company decided to fully reserve its net deferred income tax assets resulting in income tax expense of $5.9 million. Exclusive of income tax expense, loss before income taxes for the three months ended June 30, 2014 and 2013, was $0.36 million and $1.94 million, respectively. This significant improvement reflects management’s commitment to continued operational cost containment and execution of a multi-channel sales and marketing strategy. We believe that operational improvements will continue to drive overall profitability. During the three months ended June 30, 2014 and 2013, the Company’s net loss consisted of a significant amount of non-cash charges. Due to the impact of these non-cash charges on the Company’s reported net loss, the Company places greater emphasis in Adjusted EBITDA. A copy of Targeted Medical Pharma’s quarterly report on Form 10-Q for the three months ended June 30, 2014, filed with the Securities and Exchange Commission on August 14, 2014, is accessible on the Company’s website at www.tmedpharma.com and at the SEC’s website at www.sec.gov. Targeted Medical Pharma, Inc. is a Los Angeles-based biotechnology company that is committed to drug discovery and development. The company currently develops and distributes medicationsfor the treatment of chronic disease, including pain syndromes, peripheral neuropathy, hypertension, obesity, sleep and cognitive disorders. The company also develops a line of dietary supplements designed to support health and wellness. The company manufactures 10 proprietary medical foods, and recently launched its first dietary supplement, Clearwayz™. The products are sold directly to physicians and pharmacies in the U.S. The company also is developing nutrient-based systems for oral stimulation of progenitor stem cells that differentiate into neurons, red blood cells, pituitary hormones including IGF-I. Follow the Company on Twitter: @tmedpharma and on Facebook: www.facebook.com/TargetedMedicalPharma. This press release may contain forward-looking statements related to the company’s business strategy, outlook, objectives, plans, intentions or goals. The words “may,” “will,” “should,” “plans,” “explores,” “expects,” “anticipates,” “continue,” “estimate,” “project,” “intend,” and similar expressions, identify forward-looking statements within the meaning of the Private Securities Litigation Reform Act of 1995, but their absence does not mean that the statement is not forward-looking. Forward-looking statements also include any other passages that relate to expected future events or trends that can only be evaluated by events or trends that will occur in the future. The forward-looking statements are based on the opinions and estimates of management at the time the statements were made and are subject to certain risks and uncertainties that could cause actual results to differ materially from those anticipated in the forward-looking statements. These risks and uncertainties include, among others, the risk of unforeseen changes in customer budgets, unanticipated loss of customers or delays in anticipated orders, the potential failure to attract new customers due to the company’s inability to competitively market its products and services, the risk of fluctuating demand for the company’s product, the potential failure to maintain desired customer relationships, costs and risks related to development of technologies. More information about factors that could cause actual results to differ materially from those predicted in Targeted Medical Pharma’s forward-looking statements is set out in its annual report on Form 10-K for the year ended December 31, 2013, filed with the Securities and Exchange Commission. Readers are cautioned not to place undue reliance upon these forward-looking statements, which speak only as to the date of this release. Except as required by law, Targeted Medical Pharma, undertakes no obligation to update any forward-looking or other statements in this press release, whether as a result of new information, future events or otherwise. *Adjusted EBITDA refers to a financial measure that is more fully defined as net loss before net interest and other income, interest expense, income taxes, depreciation and amortization, and stock based compensation. Adjusted EBITDA is a non-GAAP financial measure which management believes reflects the Company’s ongoing business in a manner that allows for meaningful period-to-period comparisons and analysis of trends in the Company’s business, as they exclude certain income or other expenses that are not reflective of ongoing operating results. Adjusted EBITDA is commonly used to analyze companies on the basis of leverage and liquidity. However, Adjusted EBITDA is not a measure determined under GAAP in the United States of America and may not be comparable to similarly titled measures reported by other companies. Adjusted EBITDA should not be construed as a substitute for net loss or as a better measure of liquidity than cash flow from operating activities, which are determined in accordance with GAAP. Management believes that Adjusted EBITDA is a useful measure for analyzing operating results, and uses this non-GAAP financial measure to review past results and forecast future results. Los Angeles, CA, July 28, 2014 — Targeted Medical Pharma, Inc. (OTCQB: TRGM), today announced the completion of an agreement to sponsor an investigator-initiated study with the United States Army and The Henry M. Jackson Foundation for the Advancement of Military Medicine Inc. (HJF). The study, which is slated to start enrolling patients in Q2 of 2014, will involve the Company’s medical food Theramine. The placebo-controlled study will seek to enroll 128 patients with acute or sub-acute lower back pain caused by injury. The principal investigator is an employee of the U.S. government and is the Director of Research, Department of Anesthesiology at Womack Army Medical Center Fort Bragg NC. The study is projected to be completed within 18 months from the first patient enrollment. Upon completion, the Foundation and the Principal Investigator will have the first opportunity to publish the results of the study whether or not the study results are favorable. The Henry M. Jackson Foundation for the Advancement of Military Medicine, Inc. is a global organization dedicated to advancing military medical research. The Foundation serves military, medical, academic and government clients by administering, managing and supporting preeminent scientific programs that benefit members of the armed forces and civilians alike. Targeted Medical Pharma, Inc. is a Los Angeles-based biotechnology company that develops medical foods for the treatment of chronic disease, including pain syndromes, peripheral neuropathy, hypertension, obesity, sleep and cognitive disorders. The company also develops a line of dietary supplements designed to support health and wellness. The company manufactures 10 proprietary medical foods, and recently launched its first dietary supplement, Clearwayz™. The products are sold directly to physicians and pharmacies in the U.S. The company also is developing nutrient-based systems for oral stimulation of progenitor stem cells that differentiate into neurons, red blood cells, pituitary hormones including IGF-I. Los Angeles, CA, June 13, 2014 — Targeted Medical Pharma, Inc. (OTCQB: TRGM), today announced the addition of two independent members to the Company’s board of directors. The Company welcomes back health care specialist Kerry Weems to the board as an independent director and chairman of the Nominating and Governance Committee, as well as corporate finance expert Paul Pelosi, Jr. as an independent director. A nationally respected expert in health policy and government finance, Mr. Weems has served with distinction in the field of health care, including nearly 28 years in the Federal government, as Acting Administrator of the Centers for Medicare and Medicaid Services (CMS). Mr. Weems is currently Chief Executive Officer of TwinMed, a national medical supply distributor in Los Angeles. Mr. Paul Pelosi, Jr., has many years of experience in advising companies in the areas of finance, infrastructure, and sustainability. Mr. Pelosi has background in business law, public policy, the public securities markets, and has worked with numerous emerging microcap companies to develop sound business protocols. Mr. Pelosi has been a private investor and an independent adviser to emerging companies, including NASA Ames Research Center, Global Emerging Markets and AirPatrol Corporation. Mr. Pelosi graduated from Georgetown Law Center, has been a member of the California State Bar since 1996, and Real Estate Broker since 2002. Los Angeles, CA – May 23, 2014 – Targeted Medical Pharma (OTCQB: TRGM), a leader in the medical food manufacturing sector, announced today that it will be a featured presenter at the 3rd Annual Marcum MicroCap Conference on Thursday, May 29, 2014 in New York City at the Grand Hyatt Hotel. The Company’s presentation by William Shell M.D., Chief Executive Officer and Chief Science Officer, is scheduled to begin at 11:30 a.m. ET. The annual Marcum MicroCap Conference is a signature showcase for superior quality, under-followed public companies with less than $500 million in market capitalization. For more information or to register, please visit the conference website at http://www.marcumllp.com/microcap or download the free official conference app for the iPhone, iPad, or for Android mobile devices in Apple’s App Store and the Google Play Market. Marcum LLP is one of the largest independent public accounting and advisory services firms in the United States. Ranked #15 nationally, Marcum LLP offers the resources of 1,300 professionals, including over 160 partners, in 23 offices throughout the U.S., Grand Cayman and China. Headquartered in New York City, the Firm’s presence runs deep, with full-service offices strategically located in major business markets. Marcum is a member of the Marcum Group, an organization providing a comprehensive range of professional services spanning accounting and advisory, technology solutions, wealth management, and executive and professional recruiting. The Marcum Group companies include Marcum LLP; Marcum Technology LLC; Marcum Search LLC; Marcum Financial Services LLC; Marcum Bernstein & Pinchuk LLP; MarcumBuchanan Associates LLC; and Marcum Cronus Partners LLC. For more information, visit www.marcumllp.com. Los Angeles, May 20, 2014 – Targeted Medical Pharma (OTCQB: TRGM), is currently discussing the logistics of importing the Company’s medical food products into China, with a large Chinese pharmaceutical company. No assurances can be made that a definitive agreement will be consummated between the two Companies at this time. Los Angeles, CA, May 21, 2014 — Targeted Medical Pharma, Inc. (OTCQB: TRGM), a biotechnology company that develops and markets medical foods for the treatment of chronic disease, including pain syndromes, peripheral neuropathy, hypertension, obesity, sleep and cognitive disorders announced financial results for its first quarter ended March 31, 2014. William Shell, M.D., Chief Executive Officer and Chief Science Officer of Targeted Medical Pharma stated, “During the remainder of 2014 we will continue to focus on the expansion of sales and marketing efforts to increase utilization, awareness and acceptance by physicians, patients and payers with an emphasis on markets that provide near-term revenue growth opportunities. We believe this focus, combined with our cost containment efforts, will lead to an increase in revenue and overall profitability. First quarter revenues represented an anomaly as the implementation of the Affordable Care Act (the “Act”) resulted in delays in premium payments to insurance companies and increases in patient deductibles. We experienced a disruption in the payments of claims by insurance companies to the Company, which resulted in a reduction of revenue. Since our revenue is largely based on cash collections and not shipped product, we experienced a temporary decline in our reported revenue. Total revenue of $1.8 million, compared to $2.8 million during the three months ended March 31, 2013. Total gross profit of $1.2 million, compared to $1.9 million during the three months ended March 31, 2013. Adjusted EBITDA of $(0.6) million, compared to ($0.1) million during the three months ended March 31, 2013. Net loss for the three months ended March 31, 2014, was $0.97 million compared to a net loss of $0.27 million for the three months ended March 31, 2013. Our revenues are, in part, dependent upon the timing of our cash receipts which places us at risk of significant fluctuations in our reported results. During the first quarter of 2014 we experienced a decrease in collections from third party payers. Consequently, the amount of product revenue that was recognized upon the receipt of cash decreased by $0.8 million during the quarter ended March 31, 2014 compared to the quarter ended March 31, 2013. If we had not experienced a decrease in cash collections, then the impact of the cost containment efforts instituted during the fourth quarter of 2013 would have resulted in positive EBITDA during the first quarter of 2014. During the three months ended March 31, 2014 and 2013, our net loss consisted of a significant amount of non-cash charges. Due to the impact of these non-cash charges on our reported net loss, we place greater emphasis in Adjusted EBITDA. A copy of Targeted Medical Pharma’s quarterly report on Form 10-Q for the three months ended March 31, 2014, filed with the Securities and Exchange Commission on May 20, 2014, is accessible on the Company’s website at www.tmedpharma.com and at the SEC’s website at www.sec.gov. Adjusted EBITDA refers to a financial measure that is more fully defined as net loss before net interest and other income, interest expense, income taxes, depreciation and amortization, and stock based compensation. Adjusted EBITDA is a non-GAAP financial measure which management believes reflects the Company’s ongoing business in a manner that allows for meaningful period-to-period comparisons and analysis of trends in the Company’s business, as they exclude certain income or other expenses that are not reflective of ongoing operating results. Adjusted EBITDA is commonly used to analyze companies on the basis of leverage and liquidity. However, Adjusted EBITDA is not a measure determined under GAAP in the United States of America and may not be comparable to similarly titled measures reported by other companies. Adjusted EBITDA should not be construed as a substitute for net loss or as a better measure of liquidity than cash flow from operating activities, which are determined in accordance with GAAP. Management believes that Adjusted EBITDA is a useful measure for analyzing operating results, and uses this non-GAAP financial measure to review past results and forecast future results. Los Angeles, April 28, 2014 – Targeted Medical Pharma (OTCQB: TRGM), announced the completion of an agreement between Analytical Testing Laboratories (ATL), a Lebanon based company that specializes in drug testing services and inborn errors of metabolism, for the exclusive distribution of the company’s amino acid based products to physicians and pharmacies throughout the Middle East. The Agreement provides ATL with a limited exclusive license for the marketing and sales of certain products in twenty countries in the region. The Agreement includes a licensing fee, an annual minimum product purchase order and certain performance benchmarks which include meeting product registration and regulatory approvals as well as sales volume in a given country. Analytical Testing Laboratories (ATL) has been in operation since 1996. ATL is licensed by the Lebanese Ministry of Health and is directed by Dr. Amer Sakr. ATL is a specialized laboratory focusing on multidisciplinary analysis in the fields of Medical Diagnostics, Genetic Metabolic Diseases, Toxicology, Pharmaceutical Drug Testing Services, Food Chemistry & recently in Molecular Biology DNA & GMO Testing. ATL has been assigned by the Lebanese Internal Security Forces as the laboratory of choice for Forensic Toxicology & DNA Testing purposes. Also, the Ministry of Health has accredited ATL to do quality control testing on drugs, pharmaceutical & cosmetic products. Los Angeles, CA, March 31, 2014 — Targeted Medical Pharma, Inc. (OTCQB: TRGM), today announced financial results for its fourth quarter and fiscal year ended December 31, 2013. The Company posted increased revenues, gross profit and a reduction in net loss before interest, taxes, depreciation and amortization, stock based compensation (Adjusted EBITDA*) on both a year-over-year and a quarterly basis. Total revenue of $9.6 million, a 31% improvement from $7.3 million during the year ended December 31, 2012. Total gross profit of $6.6 million, a 60% improvement from $4.1 million during the year ended December 31, 2012. Adjusted EBITDA of $(2.7) million, a 41% improvement from ($4.5) million during the year ended December 31, 2012. Total revenue of $2.6 million, a 20% improvement from $2.2 million during the quarter ended September 30, 2013. Total gross profit of $1.9 million, a 22% improvement from $1.6 million during the quarter ended September 30, 2013. Adjusted EBITDA of $0.1 million, a 112% improvement from ($1.1) million during the quarter ended September 30, 2013. 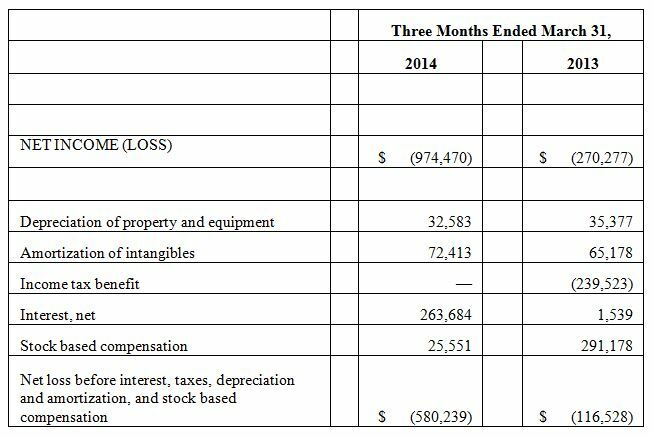 Net loss for the year ended December 31, 2013, was $9.3 million compared to a net loss of $9.6 million for the year ended December 31, 2012. During the years ended December 31, 2013 and 2012, the Company’s net loss consisted of a significant amount of non-cash charges. For instance, the net loss for the year ended December 31, 2013 was negatively affected by the Company’s decision to provide a valuation allowance of $7.4 million for its deferred tax assets. If the Company had not recorded a full valuation allowance, then the Company’s net loss would have been $1.9 million. Development of the Company’s direct to consumer business that includes dietary and nutritional supplements. A copy of Targeted Medical Pharma’s annual report on Form 10-K for the year ended December 31, 2013, filed with the Securities and Exchange Commission on March 31, 2014, is accessible on the Company’s website at www.tmedpharma.com and at the SEC’s website at www.sec.gov.